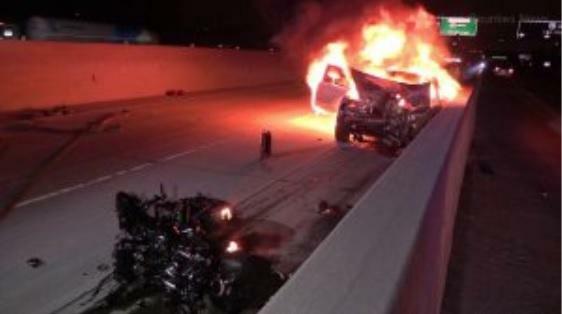 A wrong-way driver caused a fiery crash Thursday night on the 5 Freeway in Santa Ana killing a motorcyclist. The driver of a Jaguar S-TYPE was traveling southbound in the northbound lane and collided with a motorcyclist who was wearing a helmet. The motorcyclist was killed due to the high intensity of the impact regardless of the helmet, California Highway Patrol Officer Florentino Olivera said. The driver of the Jaguar S-TYPE could not initially be identified because the vehicle caught fire and badly disfigured the driver who did not survive. The CHP was able to tell it was a man based on an initial examination but have not identified him yet. "The carpool lane is divided from the general lanes. So that motorcycle had nowhere to go when he saw that vehicle coming toward him," Olivera said. The motorcyclist was identified as 36-year-old Hugo Juarez who is described as a loving husband and father<a href="https://www.gofundme.com/in-memory-of-hugo-armando-juarez">on a GoFundMe page</a> setup for the family. Wrong-drivers are fairly common in Southern California who said he tells his family and friends never to use the carpool or fast lanes if they don't have to, especially after midnight. "There’s not much traffic, so there’s no need to be in the carpool lane," he said. "Typically, when we get calls of a wrong-way driver, they’re traveling in the carpool lane." A Jaguar S type is actually based mostly on the Ford Mondeo with a plastic Jag badge on the front. Now if it was the 1964 S type or Mark II original Jaguar with heavy gauge chasis and body the driver would have been hurt but survived. Any Jag made after the XJ-R is just a base Ford rebadged as a Jaguar.